POWERFUL... as his battering fists! THRILLING... as his fighting heart! GREAT... as his never-to-be-forgotten story! The Life and times of Heavy Weight Champion Joe Louis. Tells how his childhood friend changed his life by suggesting and taking him to the neighborhood Gym instead of going to his violin lesson and becoming the Boxing Heavy Weight Champion of the World and how he held the Title for 12 years. Longer then anyone in history. 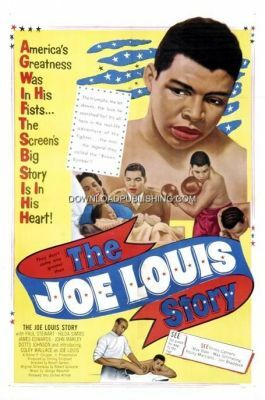 The movie shows actual fight scenes between Joe Louis and Max Baer and other Fighters of the time. Production Company: Walter P. Chrysler Jr.